For your own security and peace of mind, the standard “Backups” should always be turned on (in Papyrus, this is preset). For very important texts, “Extended Backups“ should be used. This feature can be found under “Document Properties” in the menu “Document.” Once your text reaches 1,000 words, Papyrus will offer to turn on “Extended Backups“ automatically. Different older versions of your text are stored in “Extended Backups” so you can go back and find the version from yesterday or last week. If you have reached a milestone in your text, you can choose to save an “Important Backup” (located in the “File” menu under “Revisions”), which is guaranteed to be saved in its current state. This feature has its own icon , which you can display in your toolbar. You can find your backups in the “File” menu. Regardless of where your backups are stored on your hard drive, you can always find them in Papyrus in the “File” menu. 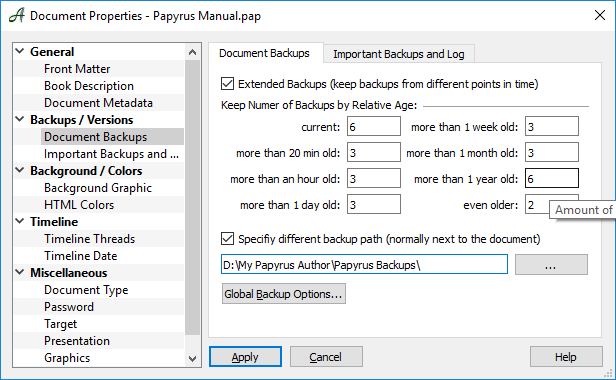 When you select the checkbox “ Create backup files,” Papyrus will create a certain amount of backup files of your document before it starts overwriting old ones. They will be saved with the same document name but with the extension “*.PB0” in the backup log. “Max. backup(s)” is where you can enter how many backups you would like to be stored (up to 9 backups). You can save your backups “In a custom directory,” so that you can be sure to always find them all in your chosen place again when you need them. These are all settings for your “everyday” type of texts. Your large, important texts (book, bachelor’s thesis, etc. ), however, need a higher level of backup protection. The button “Document-specific Backups” will open the document and important backups dialog, in which you can specify how you would like your important backups stored and also access your backups log. If you are working on an especially important text, you can use the “Document Backup” dialog (under “Document Properties” → “Backups/Versions”) to change the settings for how often you would like your current document to be backed up. 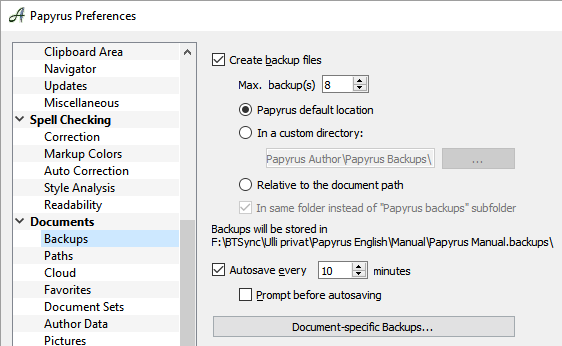 These backups are an alternative to Papyrus’s universal backups and are more extensive. Document backups will be stored in their own folder and can be found next to the original (“Documentname.backups”). If you want them to be stored somewhere else, you can enter a different path in the dialog. The advantage of these backups is that older versions (from yesterday, a week ago, a month ago, etc.) will continuously be stored, so you don’t only have access to the last x versions, but rather a selection from a longer time span. Don’t worry, though, your backup folder will never get too full. 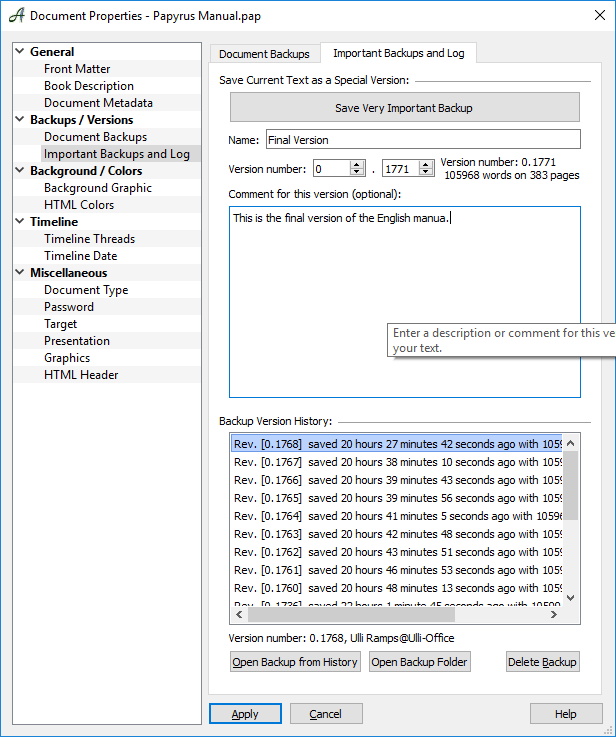 The document names of each backup have been chosen for you to see exactly how long it has been since the last time you saved your main text. Every time you make a change to your main text, the names of the backups in your folder will change accordingly. That means the current backups will be saved, as well as the number of backups you have entered for 20 minutes, for the last hour, and so on. For example: if the document name is “Papyrus Author Functions.pap” the backup folder is called “Papyrus Author Functions.backups” and the document itself is called “Ver 0+85 – 4 Hrs – 8217 Words.pap”. 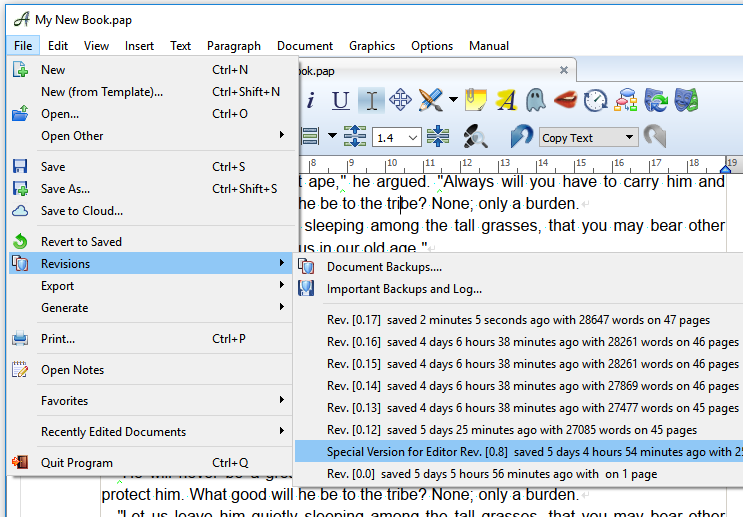 If your text has reached a certain length, Papyrus will offer to turn on document backups with a pop-up dialog. This dialog (also in the “Document Properties”) is closely related to the “Document Backups” dialog. Here you will find a list of all your backups in chronological order. The first button allows you to manually save a very important backup–after making significant changes to your document, for example. Organizing your backups by version numbers allows you to quickly and easily differentiate between the current version and older versions, so you can find what you are looking for more easily. Every backup version is given a version number with a main number and sub-numbers that come after the decimal point. For “very important backups” you have the option to add comments. The history saves the number of words contained in the version and the user who saved it. The version number will be automatically assigned to your text when you save. You have the option, though, to enter a number in this dialog manually.